Avelino Vieira scores for Peterborough Sports in their 5-0 win against Thame United last weekend. Manager Jimmy Dean insists his Peterborough Sports team are capable of toppling unbeaten Southern League Division One Central leaders Corby at the Bee Arena tomorrow (November 10, 3pm)...but it wouldn’t necessarily mean the city side are serious title challengers. Dean is predicting a top-quality tussle and a decent sized crowd as Corby seek to protect a 10-game run without defeat against a Sports team up to third in the table following last weekend’s 5-0 romp at home to Thame United. The visitors are expected to bring a small army of fans to the game so Dean is hoping Posh fans not travelling to the FA Cup tie at Bromley on Saturday will also boost the gate. “This is going to be a great game,” Dean enthused. “Corby are flying and we ain’t doing too bad. They are strong, especially defensively, but I am confident we can beat them. “We had an FA Cup hangover, but mentally I think we have now turned a corner. We were good last weekend and I have a lot of injured players back in contention for a starting place. “I’m also expecting a Corby invasion as they are a well-supported club so it would be great if Posh fans and the Peterborough public came down to give us their support. The Corby match is followed by another home humdinger against Bedford on Wednesday (November 14, 7.45pm kick off). Bedford are Dean’s tips for the title. 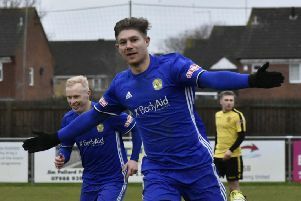 Kettering, non-league giants of the past, are currently flying at the top of the Evo Stik League Central Premier Division and are sure to bring a big following to the second qualifying round game at the Zeeco Stadium (3pm). Yaxley’s game with Wisbech is a first qualifying round replay. Second qualifying round: Stamford v Kettering Town. First qualifying round replay: Yaxley v Wisbech Town. East Division: Spalding Utd v Lincoln Utd. Division One Central: Peterborough Sports v Corby Town. Premier Division: Deeping Rangers v Rothwell Corinthians, Holbeach United v Harborough Town, Newport Pagnell Town v Pinchbeck United, Wellingborough Whitworth v Peterborough Northern Star. Division One: Blackstones v Raunds Town, Huntingdon Town v Lutterworth Town, Thrapston Town v Bourne Town.